These fringes, called tzitzit, are coiled and knotted to remind us of all the mitzvot. The numerical values of the letters that comprise the Hebrew word tzitzit add up to 600. Add the eight strings and five knots of each tzitzit, and the total is 613. Now you understand why it’s customary to let the tzitzit hang out at the waist, in plain eyesight. Having a tangible reminder of the 613 mitzvot, in turn, strengthens our mastery over the temptations of the heart. These fringes are coiled and knotted to remind us of all the mitzvotOnly garments with four (or more) corners require tzitzit, and few garments today (other than ponchos) are four-cornered, so we wear a special four-cornered tallit just so we can perform this mitzvah. During the morning prayers, men don a tallit gadol—a larger version of the tallit katan. Traditionally, young boys begin wearing a tallit katan at the age of three. Technically, tzitzit is a daytime mitzvah. According to the Kabbalah, however, tzitzit should be worn even while sleeping at night. 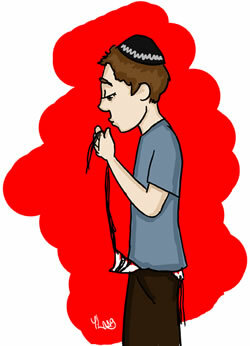 Inspect the tzitzit every day and disentangle them. If they become shortened or torn, show them to a rabbi to ascertain whether they are still kosher. Blessed are you, L‑rd our G‑d, King of the universe, who has sanctified us with His commandments, and commanded us concerning the mitzvah of tzitzit. I have a practical question & I hope you will treat it with respect because I want to know. Does tzitzit have to be washed in any particular way ? I'm assuming you would wear a clean one everyday - especially if you live in Israel. So would a man have 2 or 3 ? I mean can it go in the washing machine with everything else ? I'm guessing a tallit wouldnt need washing so often. Are tzitzit addressed in the Mishnah? Also, were they a part of the Oral Torah as per precisely how long to make them, material used, etc.? There must be more specific instructions somewhere, but where can I find it? Is the tallit addressed in the Mishnah or Oral Torah? What about tallit katan? Many of the details of the Tzitzit come from the Oral Torah. The Talmud (Menachot 38a-42b) discusses how they are made and the requirements of wearing them. Re: Women are not obligated to wear a tallit. This is because they are exempt from fulfilling almost all time-bound positive commandments (such as donning Tefilin which is done during the day or reciting the Shema at a specific time in the morning) Nonetheless, women do fulfill many of these mitzvot if they so desire. Re: These must be set aside (in "shaimos" or "geniza") and are subsequently buried. To Anonymous in Newark There are some very good articles that Rabbi Tzvi Freeman linked to a few comments back. I suggest that you have a look at them. In addition, I recommend that you read Is it Appropriate for a woman to Wear a Tallit? The Tzitzit and the kippah I hope the writer of this topic is still in touch with reading comments on this subject, and I would greatly appreciate to have a response to my following statement. Rabbi, I do thank you for taking the time to reply to my comment "Exemptions? ", with your interesting perspective. Concerning the sages, am I correct in saying that the Mishnah, in particular,itself does not in any way ban women from wearing tzitzit? :"Women, slaves and minors are exempt from the recitation of Shema and from tefillin, but are obligated for the Amida Prayer, mezuza, and Grace after meals"
Where else might I find more about women and tzitzit in the Mishnah in particular? Exemptions? Why would a woman desire to be exempt from a reminder given to all Yisrael, to keep her connections with HaShem in tact? I watched the video via the link provided, which didn't offer logical reasoning as to why a woman is or should be exempt from this reminder not to stray, while on the other hand being held fully accountable for any straying. While I do understand the sources referenced by Freida, I must disagree that women don't need reminders to keep the mitzvot throughout her day....that reminder being tzitzit. Being a woman myself, I'm fully aware of the tendency to stray from mitzvot on any given day. Tzitizt (part 2 of 2) It seems to me that when a miztvot is specific to one gender or that of the priests the phrase it is rather plain who the miztvot applies too e.g. I am just confused as to how we can assume in one place that it was all of Israel(male and female) HaShem was instructing a positive miztvot to, and where He was only addressing the males...when there is not that plain distinction. I apologize for stumbling over my words. I hope that you are able to hear my heart through this and answer accordingly. Tzitizt Why is the description of where to place the Tzitzit understood as being a literal four corner (square) as opposed to the way Yesha'yahu describes the earth in Yesha'yahu 11:12 "And he shall set up an ensign for the nations, and shall assemble the outcasts of Israel, and gather together the dispersed of Judah from the four corners of the earth." The earth is not square...which means it does not have literal four (pinnacle) corners. But still the four corners of the earth is used to describe the very most edges of the earth. So therefore how come the mitzvot of the tzitzit does not apply to the four edges of a round garment? Is this not just a description of the four edges of any garment? Also how does the "Children of Israel" being spoken to here differ from the "children of Israel" being spoken to in V'yakra 23 regarding the instructions for the Feasts, or V'yakra 11 regarding the clean and the unclean which are for both male and female. Back to Anonymous in Derry I have a feeling you didn't read the links I provided a few comments back. There was a link to Why Aren't Women and Men Treated the Same in Judaism? that gives a basic answer. Are Shabbat and Kashrut time bound? Shabbat, yes. Kashrut, no. Shabbat, however, is an exception. Since there is a prohibition involved (not working), so anyone affected by the prohibition is also obligated in the positive side of the mitzvah. Pesach is another exception. Kashrut is a set of prohibitions, not obligations.